For political people in Texas, this is a very big week, perhaps the most important week of the 2014 election season. But for Texas Democrats, this is a week that many haven’t seen for the better part of a decade. The strongest Democratic ticket in 20 years have in back-to-back contests with their Republican opponents. Tonight at 7pm, the Lieutenant Gubernatorial debate will see Democrat Leticia Van de Putte and Republican Dan Patrick face off. With the apparent contrasts between these two, this is likely to get interesting. You can watch the debate streamed live via the Texas Tribune, or check out other viewing opportunities for your area. You can also follow along via social media with the hashtags #LtGovDebate and #VivaLeticia. Tomorrow night at 8pm is the Second Gubernatorial Debate between Democrat Wendy Davis and her Republican opponent Greg Abbott. 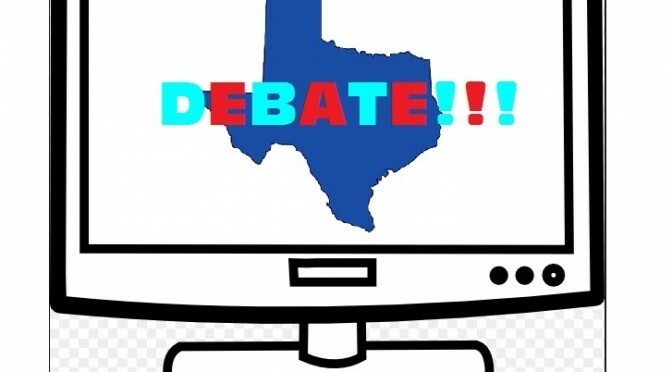 Several PBS stations, including KUHT Channel 8 in Houston, KLRU Channel 2 in Austin, KERA Channel 13 in Dallas/ Fort Worth and KCOS Channel 13 in El Paso will be airing this debate live, as well as other streaming outlets available here. For social media, you can follow along with the hashtags #TexasDebates and #TeamWendy. Let’s hope that after these events, the full formats of the debate will be available too. If so they’ll definitely be posted here at texasleftist.com. But for now, be sure to catch these very important nights for Texas politics!! 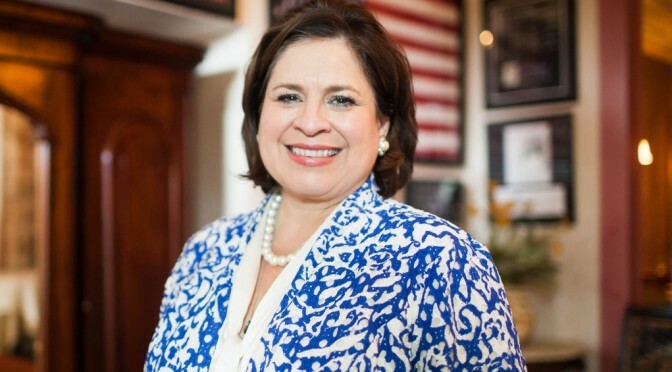 In the Ninth installment of the 2014 Texas Leftist Candidate Questionnaire, we hear from Leticia Van de Putte, Texas State Senator and candidate for Lieutenant Governor. She is a Democrat. LVdP: Our state government is responsible for public safety, public education, and building the infrastructure for a strong economy. These are critical services to our communities that can no longer be ignored. Sadly, we have politicians who are more interested in political score cards than our student’s report cards, numerous school districts have been left without basic resources. Rich and poor alike, fast-growing, suburban, and rural, school districts across Texas have had no other option but to sue the state because our neighborhood schools remain underfunded and our school finance system is broken. As Lieutenant Governor, I will ensure that government works for the people. That it is meeting the needs of our growing Texas population and fulfilling our responsibility of prioritizing public education. TL: If elected, name 3 top priorities you hope to accomplish for 2015 legislative session. Describe how you plan to accomplish them. Education: Getting kids to and through a quality education – My Texas First plan will adequately fund our local neighborhood schools. Overcrowded classrooms in grades Kindergarten through 4th grade tripled after the education cuts of 2011. 11,000 teacher jobs were gone just like that. Parents should no longer have to wonder if their child’s class will be overcrowded, students should no longer have to wonder whether one test will determine whether they graduate, and teachers should no longer have to pull money from their pockets just so that their students have basic supplies. And I will make higher education within the reach of every hard-working high school graduate. Not every high school graduate will go to college but every one of them deserves the opportunity to go. That’s why I am proposing we create the Texas Promise Scholarship Program. It would offer all qualifying high school graduates two years of free community college or advanced technical training. Higher education is getting further and further out of reach for everyday Texans – but we can change that. A one time investment of capital that is sitting in state budget coffers today can change the lives of an entire generation of Texans. I want Texas voters to have the final say, so when it passes the legislature next session, it would be put before voters as a constitutional amendment. Improved quality of life for veterans, service members and their families – As the daughter of a veteran, I know that it takes a family to serve and that to truly honor those who protect us, we must improve the quality of life for military members, veterans, and their families and support our military bases. My Texas First Plan will ensure that our veterans receive the health care they need and have earned; have access to higher education and training opportunities; and get college credit for their military service. I will continue the work I have done as Chair of the Senate Committee on Veteran Affairs and Military Installations to fulfill the promise to our military members, veterans and their families that Texas is the number one state for them to return, prosper, raise their families, and retire. Building roads for the 21st century – I have a plan to invest in good public roads and a sustainable future water supply. These two ingredients that are essential for a prosperous economic future have been neglected for too long. I will lead with courage to move our state towards making smart investments in roads and bridges that keep Texas moving forward. And I will ensure that our families and communities have the water they need to grow. With Texas being one of the most rapidly growing states and having just suffered one of the worst droughts in its history, we can no longer afford for basic needs such as roads and water to be neglected. TL: A 2013 survey found that 54 percent of Texas voters support Medicaid Expansion under the Affordable Care Act. Expansion is also supported by the Texas Hospital Association. Without Medicaid Expansion or an alternate solution, Texas Hospitals are having to provide over $5 billion dollars annually in uncompensated care to patients who lack insurance. This leaves Texas taxpayers paying not only for the uncompensated care of our residents, but also paying for expanded healthcare benefits in other states. If elected Lieutenant Governor, would you support Medicaid Expansion or an alternate solution for the state of Texas, so we can bring our tax dollars back where they belong? If not, please explain why. If so, please explain how you would work to pass such a measure. LVdP: As a practicing pharmacist for over thirty years, I have seen the successes and shortcomings of the healthcare system firsthand. After decades of experience serving my community, I know that access to healthcare is a right that all Texans deserve, not just the ones who can afford it. I understand that healthcare is a costly and complex system in our state, but also realize that Texas simply cannot thrive when 1 out of every 4 Texans has no health insurance coverage. With the highest rate of uninsured in the country, Texas hospitals struggle to provide over $4 billion per year in uncompensated care, while county and local governments spend roughly $2.5 billion in local tax dollars on indigent care. We need a solution that will better utilize our resources and increase access to effective services, so that millions of hard-working Texans can have the opportunity to care for themselves and their families. I’m committed to work with all stakeholders to develop a plan that will incorporate personal responsibility without sacrificing care. I will put politics aside and encourage collaboration to expand Medicaid eligibility to up to 138% of the federal poverty line through a customized solution designed to meet the unique needs of our state. I will facilitate negotiations between the Texas Health and Human Services Commission and the federal government to reach reasonable compromises and obtain approval of a Texas Solution. I will ensure that Texas maintains the flexibility to make significant reforms to the Medicaid program. A Texas solution could include cost-sharing provisions found in plans already negotiated by other conservative states, such as manageable co-pays and premiums based on income, contributions to health savings accounts, healthy lifestyle incentives, and even using federal funds to buy private insurance. LVdP: I’m a sixth generation Texan, a pharmacist for over 30 years, and a proven effective legislator for over 20 years. I’m a mother and a grandmother, and I’m a Texan first. I bring my experience as a pharmacist and a small business owner to this race and I have a prescription for Texas. From ending high stakes testing for our students to ensuring all qualified high school graduates have the opportunity to continue their education, I have a prescription to build roads and highways so we can continue to support our businesses and create high paying jobs in Texas. My prescription will ensure veterans and their families have access to the resources they need and have earned, and we will secure the border and hold Washington accountable to fix our broken immigration system. A leader listens first and then works with the brightest minds, regardless of political affiliation, to put Texas first. I am determined to leave a Texas with more opportunity for my grandchildren than was given to my generation. That means fighting for our neighborhood schools, ensuring affordable health care, building a smart economy, and investing in a strong infrastructure. As Lieutenant Governor, I’ll make sure Texas is a better place to live, learn, and start a business. LVdP: I love to cook for my large family. My husband Pete and I will usually have our kids and grandkids come over on Sunday nights and I make my speciality which they call ‘The Holy Trinity’. It is frijoles (beans), fideo (vermicelli), and picadillo (meat). Thanks to Senator Van de Putte for her participation. Few places in the city of Houston are more public, or more treasured than Discovery Green Park. Though it’s one of the most recent public spaces created in Downtown, the park has quickly become a destination for residents, convention visitors and tourists. 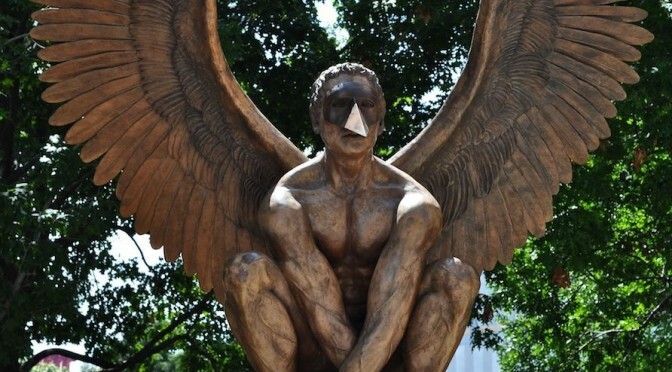 For over 25 years, Marín has presented his winged sculptures in more than 200 exhibits worldwide. Wings of the City had been viewed by more than one million people on Mexico’s Paseo de la Reforma before appearing at the Brownsville Museum of Fine Arts, and now at Discovery Green! The allegorical and fantastic creatures portray perfection of the human body, and spark dialogue around themes of desire, will and determination with the body and mind. Since the segment, I have had a chance to view Wings of the City, and must say that it is an excellent collection of works, made even more effective by strategic placements around the park. Venue makes a difference in this context, and the art simply wouldn’t be the same if it were confined within a museum. After viewing the work, you can count me in the group that has no problem with it. But as KPRC Local 2 reports, there are still plenty of people, even after viewing, that do take issue. What is your view about Wings of the City? Should it be allowed at Discovery Green? Let me know your opinion in the comments.